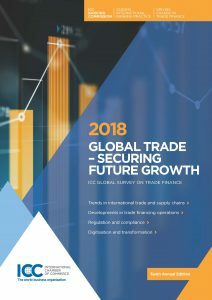 Conducted annually, the ICC Global Survey report is an authoritative review of the trade finance industry, based on exclusive information from over 250 banks in more than 90 countries. 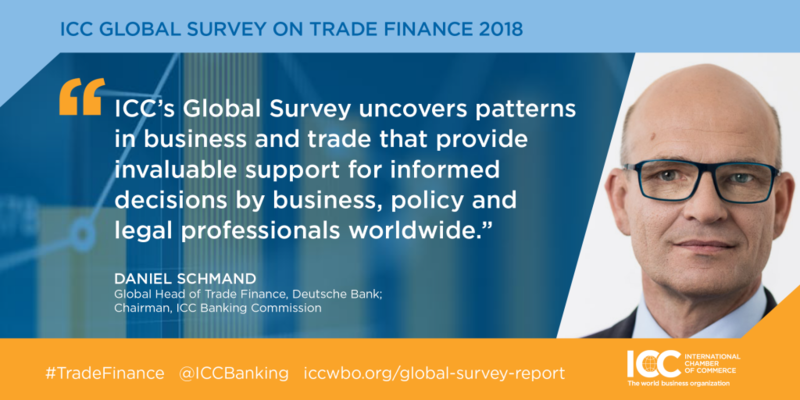 The survey results are bolstered by contributions from an international array of leading voices on trade and finance, including experts from the World Bank, the Boston Consulting Group (BCG), the World Trade Organization, and the International Trade Centre. Among the many Global Survey findings, responses show that banks are bullish on future trade finance growth trends. Nearly three quarters of banks presented an optimistic outlook for the next 12 months, with respondents headquartered in Africa and Asia Pacific the most positive, at 89% and 81% respectively. Two thirds of banks reported values increased of traditional trade finance provided to the market in 2017, while 43% reported their book of business in SCF grew. Looking ahead into the medium and longer term, only 5% of respondents consider traditional trade finance a strategic area of focus in the next 3-5 years. In contrast, 72% consider traditional trade finance a priority in the next 12 months. Nearly half of respondents agreed that attracting non-bank capital, leveraging emerging technologies such as blockchain and shifting geographical coverage were priority areas for the next 3-5 years.